“Asylums and the Insane in Early Twentieth-Century China,” is the title of the talk to be given by Emily Baum, associate professor of modern Chinese history at UC Irvine, at the John M. Pfau Library, room PL-4005. How early 20th century China understood “madness” will be the focus of the next Modern China Lecture at Cal State San Bernardino when it resumes in March. 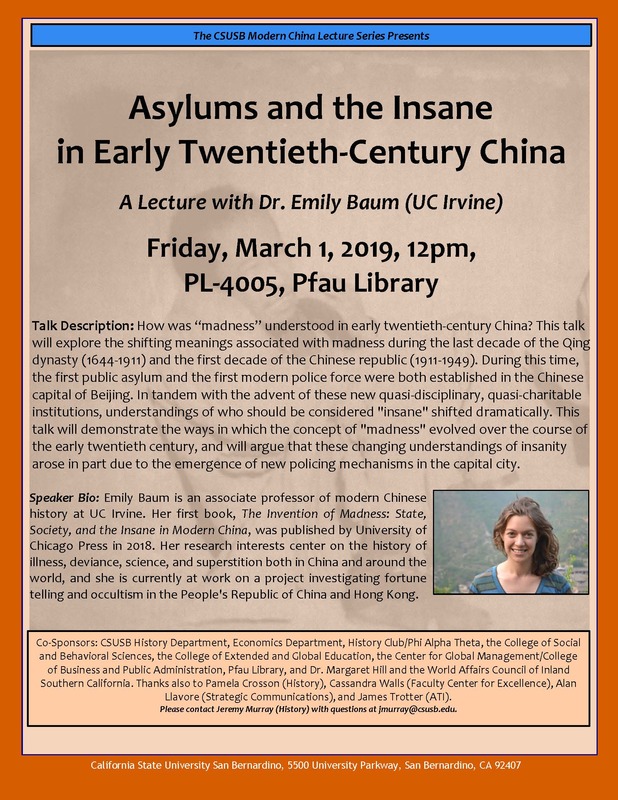 “Asylums and the Insane in Early Twentieth-Century China,” is the title of the talk to be given by Emily Baum, associate professor of modern Chinese history at UC Irvine, beginning at noon on Friday, March 1, at the John M. Pfau Library, room PL-4005. Baum will explore how madness was understood in early 20th century China, and the shifting meanings associated with madness during the last decade of the Qing dynasty (1644-1911) and the first decade of the Chinese republic (1911-1949). During this time, the first public asylum and the first modern police force were both established in the Chinese capital of Beijing. In tandem with the advent of these new quasi-disciplinary, quasi-charitable institutions, understandings of who should be considered “insane” shifted dramatically. Baum’s presentation will demonstrate the ways in which the concept of “madness” evolved over the course of the early 20th century, and will argue that these changing understandings of insanity arose in part due to the emergence of new policing mechanisms in the capital city. In addition to her teaching duties, Baum is the author of “The Invention of Madness: State, Society, and the Insane in Modern China,” published by University of Chicago Press in 2018. A book signing will take place after the lecture, with copies of the book available for purchase. Baum’s research interests center on the history of illness, deviance, science and superstition both in China and around the world, and she is currently at work on a project investigating fortune telling and occultism in the People’s Republic of China and Hong Kong. The Modern China Lecture Series was initiated to promote awareness of important issues related to China for those on the CSUSB campus and in the community. In the series of more than 40 lectures, workshops, film screenings and roundtable forums since January 2014, China scholars from UC San Diego, UC Riverside, the Claremont Colleges, UCLA, USC, UC Irvine and other institutions have visited the CSUSB campus to share their expertise and opinions. Speakers in the series have included specialists in history, economics, political science, philosophy, finance, security studies, literature, anthropology and other fields. Ruixue Jia, an assistant professor of economics at UC San Diego, whose presentation will focus on political hierarchy and regional development in China from the years 1000-2000. The series cosponsors are the CSUSB Department of History, the Department of Economics, the History Club/Phi Alpha Theta, the College of Social and Behavioral Sciences, the College of Extended and Global Education, the Center for Global Management/Jack H, Brown College of Business and Public Administration, John M. Pfau Library, and Margaret Hill and the World Affairs Council of Inland Southern California. For more information on the March 1 event or the Modern China Lecture Series, contact Jeremy Murray, associate professor of history, at jmurray@csusb.edu.